Thing 1 is nine years old today! 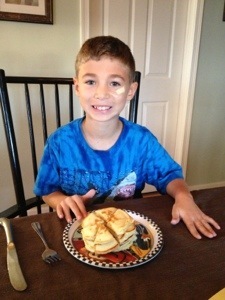 He gets a full stack of pancakes for breakfast. The band aid is compliments of yesterday’s neighborhood football game. Don’t let these smiling faces fool you. It’s back to school day. 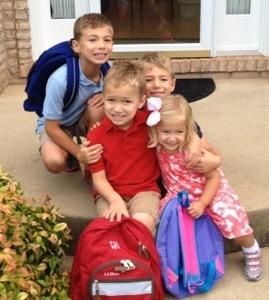 Thing 1 is in third grade, Thing 2 starts second grade, and, get ready world, Thing 3 begins kindergarten today! Continuing our yearly tradition, we went to a preseason NFL game for the third year in a row. 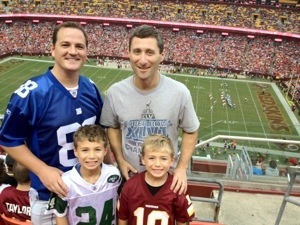 This year we went back to the Redskins’ FedEx Field, despite my declarations that I’d never return. Suburban Uncle gave Thing 2 tickets for his birthday. With all the hoopla around here for Robert Griffin III (RG3), it was a big event. We also kept the streak alive: Three games where it rained. Thing 1: Daddy, why don’t you wear sneakers to work? Me: I don’t know, I try to be professional I guess. Thing 1: You’re not a professional. You don’t even play on a team! Evidently, pro athletes are the only professionals. Living in a swing state, Virginia, near Washington DC, we’re getting a lot of attention in the media and from the presidential candidates. ? Today, Barack Obama will be in nearby Leesburg. ?The attention sparked a conversation this morning. Me: ?Barack Obama will be in Leesburg today. Thing 2: ?He just walks around the streets? Me: ?No, he’ll be making a speech somewhere with a lot of people. Thing 1: ?Maybe Costco! ?Costco is pretty big. Me: ?I don’t think the president goes to Costco. ?He has people who go shopping for him. Thing 1: ?Like his wife? It should never have taken this long. I blame myself, really. There were some early missteps, perhaps, but that’s still no excuse. Until last week, both Thing 1 and Thing 2, ages 8 and 7, could not ride a bike. A couple years ago we had bikes with training wheels, and took them off to try to learn. But they had some falls, got frustrated, and developed an aversion to anything having to do with riding a bike. This was around the time Thing 4 was born, and Thing 3 was a handful and a half, so it was hard to find the time to teach them. Finally we had to lay down an ultimatum. It was as much an ultimatum for me than for them. I told them kids their age should know how to ride a bike. It’s like swimming, reading, and tying your shoes. But I was also thinking, dads with kids of a certain age should have already taught them how to ride a bike. Mission accomplished. Two more to go. Mother’s Day 2012. 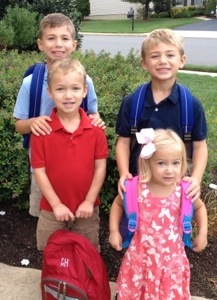 I’m always amazed when we get a picture with all 4 looking at the camera. Watching four kids develop, it’s interesting to see how, even though all four have the same environment, each develops into something very different. Their unique personalities emerged early on, and stay true even as they get older. Thing 1 is The Thinker. He is reserved, and carefully considers his alternatives before acting. When you talk to him you can see the wheels turning. He is always thinking two steps ahead. He absolutely devours books and information like sports scores. His NCAA bracket entry is beating 99.6% of all entries on ESPN.com and you get the feeling it’s no accident. Thing 2 is The Feeler. He is a people person. He loves being around his family and friends. He doesn’t ask where we’re going, but who will be there. He is sensitive and empathetic. When his brother and sister were crying as babies, he was very concerned and jumped to help them. Since his earliest years he has been a hugger, randomly walking up to me and giving a hug. Thing 3 is without a doubt The Wildcard. You never know what you are going to get. At times he is sweet, sensitive, and follows instructions. At other times he is off doing his own thing, in his own world, running across a busy parking lot in chase of a bird. One minute he’s telling his sister her hair is so pretty, the next he’s grabbing her doll and throwing it down the stairs. He is a constant stream of consciousness, saying whatever pops into his head at the moment. His random questions have been well documented here. I defy you to spend 10 minutes in conversation with him and not break into laughter…that is, if he doesn’t drive you crazy first. 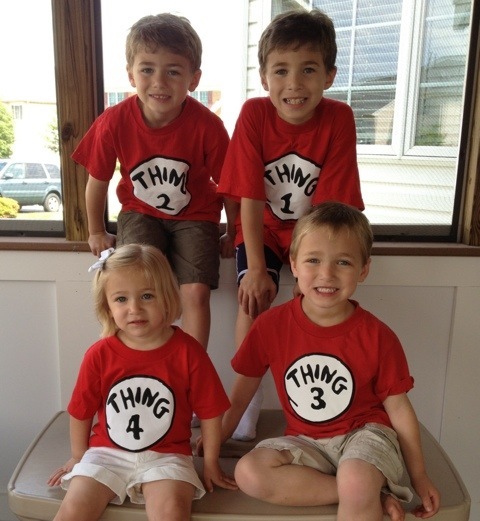 Thing 4 is The Princess. And not just because she is the youngest and only girl, so SuburbanDaddy can’t help but do whatever she asks. She is just such a girly-girl. You would think with 3 older brothers she would be rough and tumble, which she is to some degree. But she is all about pink, and purses, and dancing, and dolls, and pigtails, and we love every minute of it.